Chinadaily Forum › BBS › Life in China › Q&A › Teaching English in China: Are you qualified? Two Chinese employees at an English teaching school in Beijing were given suspended sentences after fabricating diplomas for foreign teachers, prompting widespread suspicions over foreign English teachers' qualifications. The People's Court in Beijing's Tongzhou sentenced the two people, surnamed Xia and Wang, after they were convicted of fabricating foreigners' diplomas so that they could teach at their institutions, China National Radio reported on Tuesday. The verdict said that Xia asked Wang to fabricate certificates for the two foreigners last year. Wang and Xia were sentenced to eight months and one year on probation respectively, and were fined 10,000 yuan ($1,590). The report did not mention what punishment the foreigners received. The incident has ignited society's worries over foreign English teachers' certificates. According to the State Administration of Foreign Expert Affairs (SAFEA), foreign teachers who work for private learning institutions must have work permit. Major cities such as Beijing require foreigners to have bachelor degrees or above and a minimum of two years' work experience to obtain work permits, the Beijing government said in 2014. The People's Digest reported in 2014 that only 500 out of 7,000 institutions are qualified to hire foreign teachers. Zhang, from Firstleap, an English learning institution, told the Beijing News that at least half of foreign English teachers teach at illegal schools. Not only are these schools illegal, some foreign teachers are also not qualified. Wang Yushi, an official from SAFEA, told media that there were 400,000 foreigners working in China's education industry in 2017, but only one third of them are qualified. Some do not possess diplomas, while others are not even native English speakers, Cassey Chen, an employee in charge of recruiting foreign employees at a Beijing English teaching center, told the Global Times. "The fact is, the more Caucasian you look, the higher salary you will get because most parents prefer Caucasians over other races," she added. Chen said that the government has been tightening its regulation of foreign teachers in recent years. "Sometimes they do surprise inspections, and the institution will be fined at least 10,000 yuan if there are any illegalities," she added. In 2015, all the foreign teachers at a Hangzhou branch of Disney English, a Disney subsidiary that teaches English, disappeared overnight after a police raid, local newspaper Metropolitan Express reported. It said that the reason for their disappearance was that none of them were qualified. "Most English teaching institutes lack qualified foreign teachers," said Chen. Before he left for China on Monday to attend the 2018 Boao Forum for Asia, Philippine President Rodrigo Duterte said that he would try to send 100,000 Filipino English teachers to teach in China, Xinhua News Agency reported on Thursday. However, despite concerns over their qualifications, foreign teachers are popular not only among Chinese English teaching institutions, but also with Chinese parents. 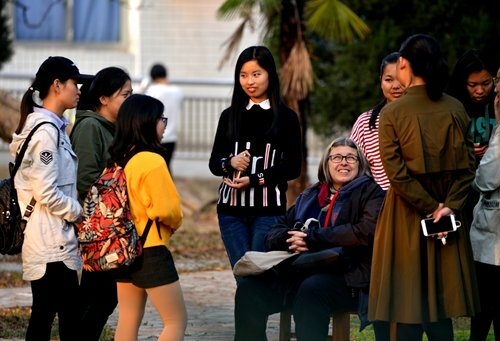 Six parents contacted by the Global Times said they prefer their kids to learn English from foreigners than from Chinese. "They (children) can learn authentic English from these foreigners," said a Beijing mother surnamed Wang. Statistics show that Chinese children are learning English at younger ages than before. Nearly 70 percent of the 2,003 respondents reported that their own children or children they know started learning English before the age of 5, mainly due to Chinese parents' fixation on giving children an early advantage, the Xinhua News Agency reported in 2016. It said that many parents send their kids to early childhood English-language learning institutions, even though they can be expensive. Some 39 percent of respondents said parents pay between 10,000 and 20,000 yuan annually to such institutions. "The myth about foreign teachers reflects some parents' superficial understanding about English learning. These who haven't received proper training can only provide simple conversation skills, not systematic language education," Xiong Binqi, vice president of 21st Century Education Research Institute told the Global Times. There are several problems with Caucasian English teachers. Hardly any of them speak or understand Chinese, they require more pay to do the same job, and many of them have ulterior motives such as spreading western propaganda and religions. To have an advantage in the global workforce all you really need is conversational English. Diagramming sentences and having a big vocabulary are not necessary. That's no justification for questioning their qualifications; besides, such foreign teachers teaching English in China beat the pants off Chinese English teacher when it comes to English writing skills. In effect, most Chinese English teachers don't even have the ability to writing something clearly in English just like you, who sets stores by Chinese-styled rote learning. You don't even deserve to ream such foreign teachers out since you don't understand Chinese as well. It could be argued that China doesn't need Filipino English teachers since Chinese students have already found the most talented English teacher one could find in China, drum roll please, robert. China could use his expertise and tape into his hitherto unheard-off talents, such as cuddling up to Kim and Putin and telling us that if he had been born in Russia, his life would have been different. Or If he had had a chance, he would have married Sarah Huckabee Sanders or Sarah Palin. Your conversational English is meh; no one wants to write like a chav like you in China. Just ask Chinese students which foreign publication they deem the best one.